It can be really annoying when you plug your iPhone into the USB port of your Computer only to find that your iPhone is not showing up in iTunes. There are a number of reasons for this problem and you will find below some of the reliable solutions that have worked for us. Normally your iPhone or iPad should show up immediately in iTunes as soon as you plug your iPhone into the USB port of your computer. 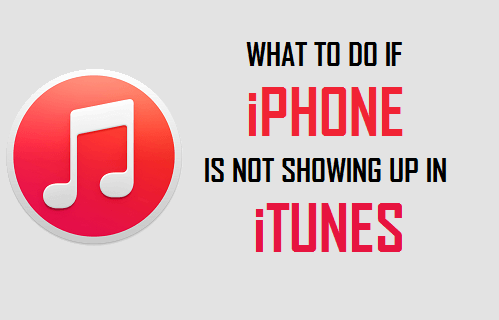 However, it is not uncommon to find iPhone not showing up in iTunes, even if your device is properly plugged into the Computer. Most of the times the issue can be resolved by pulling out the iPhone from the USB port of the Computer and plugging it back again into a different USB port or even into the same USB port. However, this simple fix may not work in case there are other reasons for this problem. Let us take a look at some of the fixes that have worked for us and some other fixes that have worked for other iPhone users. It is quite common for USB hubs to develop problems and this might be the reason for your iPhone not showing up in iTunes. Hence, plug your iPhone directly to the USB port of your Computer, instead of connecting it through a USB hub. Restarting iPhone is a common troubleshooting step that works in many cases by clearing out minor software bugs that might be preventing your iPhone from showing up on iTunes. 1. Press and hold down the Power and Home buttons on your iPhone at the same time, until you see Slide to Power OFF screen. Note: In case of iPhone 7, press and hold down the Power and Volume Down buttons at the same time. 2. Next, Power OFF your iPhone by sliding your finger across the slide to Power OFF button (See image above). 3. Wait for 10 seconds and Restart Your iPhone again by pressing the Power button. Similarly, restarting the computer can clear up minor software glitches and help in fixing problems. 1. 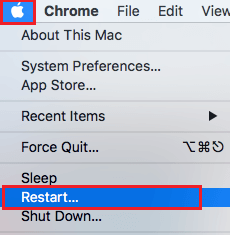 To Restart Mac, click on the Apple Logo in the top Menu bar on your Mac and then click on Restart… in the Drop down menu. 2. 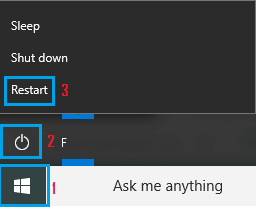 To Restart Windows Computer, click on the Windows Start button (1). Next, click on the Power icon (2) and then click on Restart (3) in the little Menu that comes up (See image below). In case you are plugging your iPhone into a computer for the first time you will see “Trust This Computer?” Prompt on your iPhone. 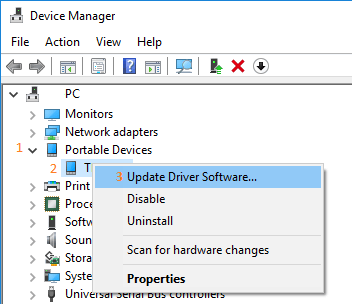 This prompt can also come up on trusted computers, in case the computer has gone through hardware or software related changes. Your iPhone will not show up in iTunes, in case you did not respond to “Trust This Computer Prompt” or you clicked on “Don’t Trust” Option by mistake. 1. Take a look at your iPhone and see if there is a “Trust This Computer” prompt on it. 2. In case there is a prompt, tap on Trust and your iPhone should immediately show up on iTunes. 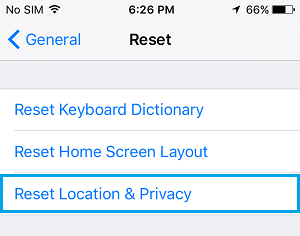 In case you believe that you had missed this prompt or clicked on the wrong response, you can fix this issue be resetting Location and Privacy settings on your iPhone. 3. On the next screen, tap on Reset. 4. 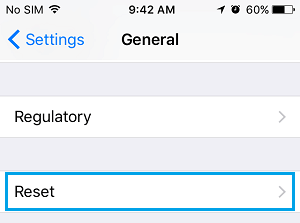 On the Reset screen, tap on Reset Location & Privacy Option. 5. 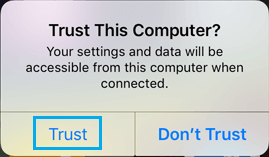 After this, plug your iPhone into the Computer, you should now see Trust this Computer prompt on your iPhone. 6. Tap on Trust and your iPhone should now show up in iTunes. Note: Resetting Location & Privacy will also reset location and privacy settings for other apps and services that use your location data. Over a period of time it is quite possible for Apple related drivers to go out of date or get corrupted on your computer. This is especially true in the case of a Windows Computer. 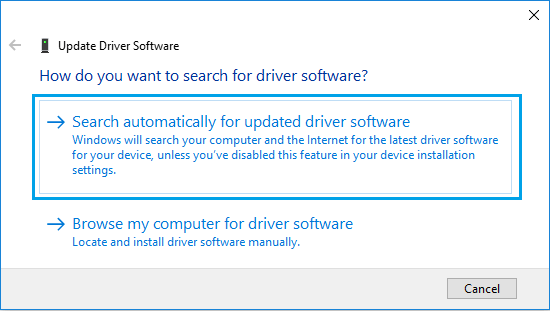 Luckily, the problem goes away as soon as you update or reinstall the drivers by following the steps below. 1. Make sure that you are logged in to your Admin Account. 6. After the Driver Update process is completed, connect your iPhone to the computer via USB cable, and see if your iPhone is now showing up in iTunes. 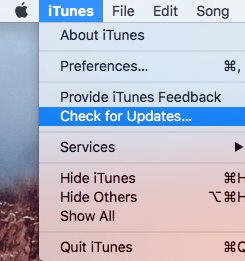 Even if you are prompted to install software updates on your computer, it is quite possible that you may have either missed an update notification for iTunes or your computer may not have installed the update properly. Follow the steps below to make sure that your Computer is up to date with the latest version of iTunes. 2. Next, click on iTunes option in the top Menu bar of your Mac and then click on Check For Updates… option in the drop-down menu. 3. Next, you will see a message, informing you whether the version of iTunes on your Mac is the latest one or it needs to updated. On the Settings screen, click on Update & Security option. On the next screen, click on Check for updates. Plug your iPhone back into the USB port of your Computer and see if it is showing up in iTunes.